The three-piece act performed at this summer's London Olympics closing ceremony and their album The 2nd Law recently reached number 2 in the stateside charts. 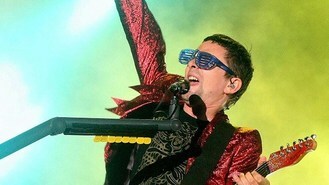 Matt told the Daily Star: "We have always considered conquering America the ultimate challenge." Bassist Chris Wolstenholme added: "You don't think about it when you start, you're just content to be recognised on home soil. But then you want something more." The new album, The 2nd Law, is full of funk, dub-step and orchestral touches and has hit number 1 in several countries. Singer and guitarist Matt admitted of the album: "I'm disappointed that we don't have many acoustic tracks, more quiet moments." In recent years, Muse have become well known for laser show filled live performances. And Matt promised: "We'll have an even crazier light show than on the last tour."